This page shows the unique attributes for a Harmony USB Human Interface Device (HID) device project. To get the most out of this page it is useful to have reviewed the USB Device Page showing the Harmony features common to all device projects. After finishing this page you should be able to more easily follow the step-by-step description of Developer Help's example HID device project. HID devices respond to host requests by returning a data element called an HID Report. 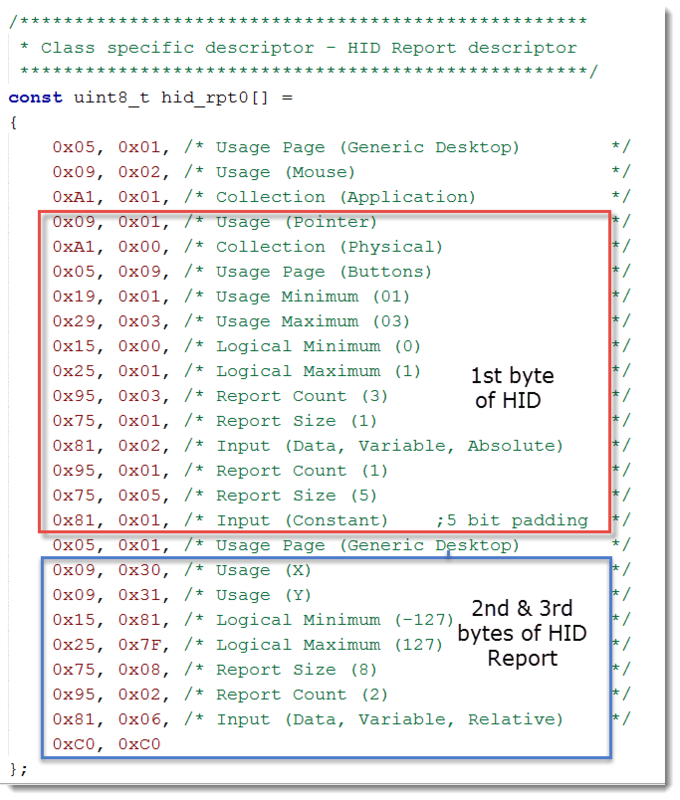 The length and format of the HID Report is set by the HID Report Descriptor. It is the responsibility of the application to format the HID report in compliance with the HID report descriptor. The sample Harmony USB projects use some of the most common HID report examples including a mouse, a keyboard and a user-defined protocol. This examples below are the HID Report formats for a simple three-button mouse and a game pad controller. The HID Report Descriptor resides in the device and defines the format which the device will send messages to the host. This information is shared with the host during enumeration. The second and third bytes each have a range of -127 to +127 and their input is variable (set by the applications). Does the construction of the HID Report Descriptor appear a little complex to you? If it does, you are not alone. 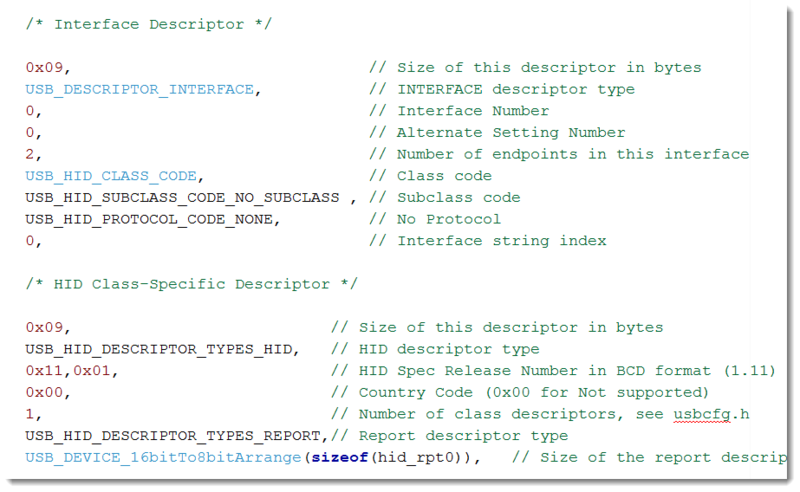 For details on the creation and interpretation of HID Report Descriptors refer to the USB organization's HID Developer's Page. The sample USB Device applications supplied with Harmony have a comprehensive set of predefined HID Descriptor reports which can be copied and used in your application. USB specifications allow the developer to select the Vendor/Product ID numbers, power consumption figures, as well as any identification text strings used. 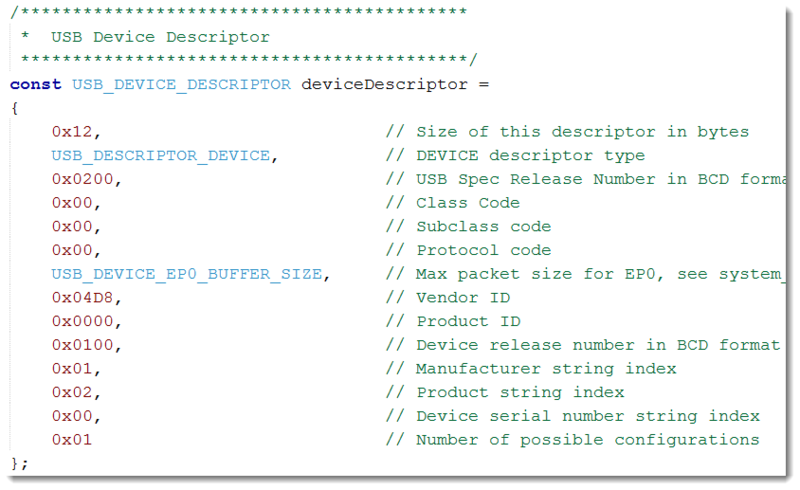 Below is an example of a Device Descriptor for a single configuration HID device. The device configuration has a maximum power consumption of 50 ma, and a Vendor ID/Product ID (VID/PID) of 0x0480/0x0000. There are two identifying text strings for this device. Harmony USB projects schedule a HID Driver Task (either DRV_USBFS_Tasks or DRV_USBHS_Tasks) to run on each iteration of the main while loop. When the device is enumerated a user-written function is designated as the HID Driver Event Handler by USB_DEVICE_HID_EventHandlerSet(). device will set the new idle rate. responds by sending the current idle rate value. How is the Driver Event Handler used in an Application? One of the most common usages of the HID Event Handler is to inform the application of either the receipt or the successful transmission of an HID Report. 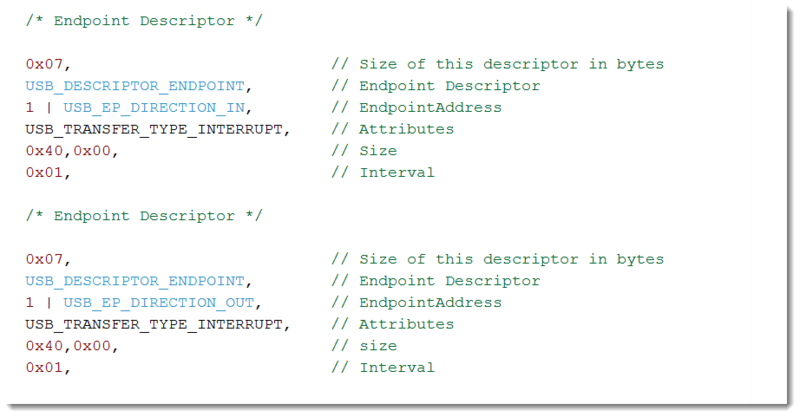 The code below shows an application program working with the a sample event handler to track the transmission of a report. appdata.SendBufferEmpty = TRUE ; // Set a flag for the application program. if (appdata.SendBufferEmpty == TRUE) // Can the data be sent? &appReport, sizeof(appReport)); // initiate sending the HID Report. if (appdata.SendbufferEmpty == TRUE) // Did EventHandler Set the flag?